Explore the Amazon River with this interactive from the New York Hall of Science. In explore mode, your students can move the magnifying glass over the mural and select a fish or reptile. At the bottom of the screen the students will see an image and text and hear audio about the species they chose. 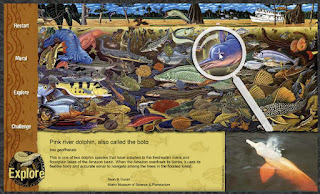 Click on the mural button to learn about the artist and how he learned about the Amazon creatures. If your students are experts, have them click on the challenge mode and they will answer questions about the different Amazon river inhabitants.